The Tetra Air pump came with an air regulator valve, which is actually pretty nice. Literally can't hear this thing--BEAUTIFUL!! Will tack this to the wall so it's not so whiskey tango hanging there. 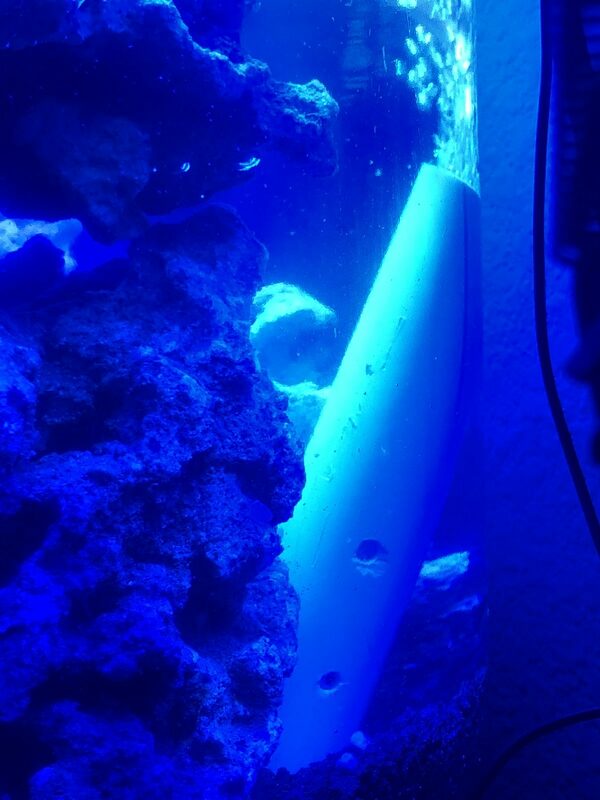 After MUCH effort and some cursing, managed to stuff the air stone beneath the central rock structure, so the air bubbles are now coming up a central water column. Cuts down on the bubble spray and I think aerates the whole jar better. 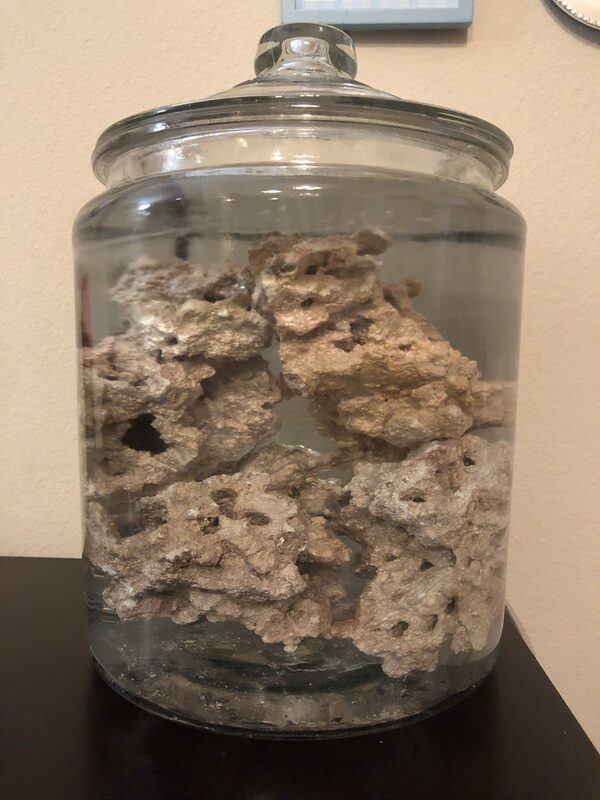 I purchased 5lbs of Maori dry rock from the LFS, and tried to diligently glue the stuff together in a nice arch, but ended up mostly just gluing myself. LITERALLY--glue all over my hands. Ended up spending about an hour soaking my fingers in fingernail remover. So, the rocks aren't all that well attached to one another, but still managed to make a fair arch/hole, which was the goal. 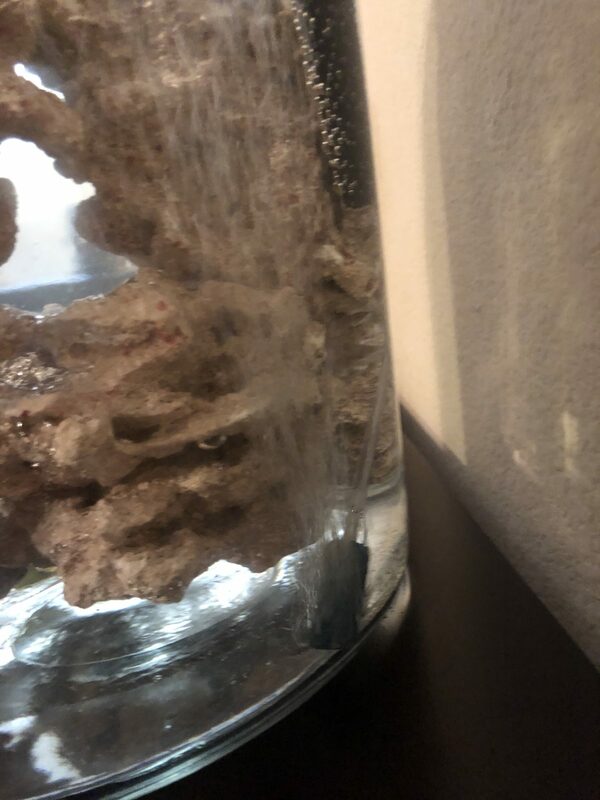 I went ahead and put in the salt water, which I make using Red Sea Coral Pro salt, so that the dry rock can start the process of becoming live. 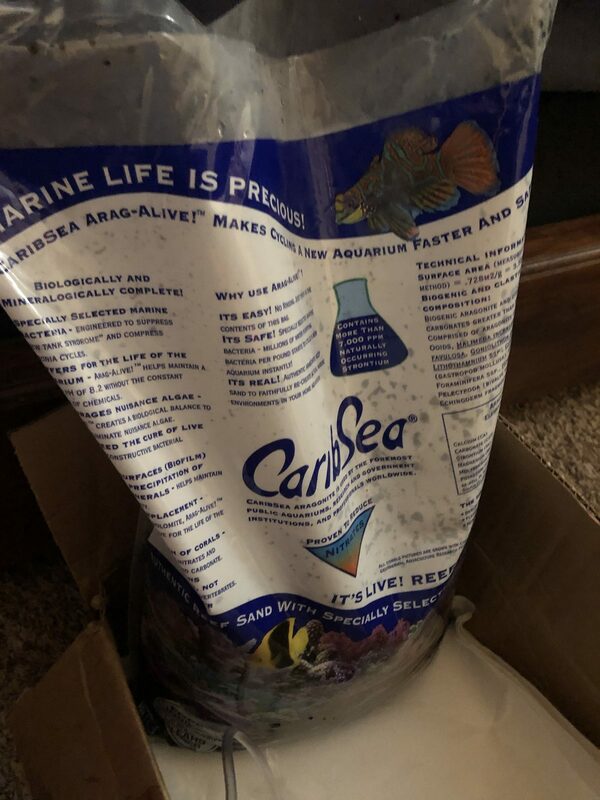 I ordered Carib-Sea Arag Alive Hawaiian black sand because I think that will look cool with the future corals. It should arrive any day, and I will probably be due to pull out some nasty water anyway before introducing the sand. Due to the size of the rocks, I figured the sand was going to end up more around the rocks than under it. I'll battle through getting it in there some how. 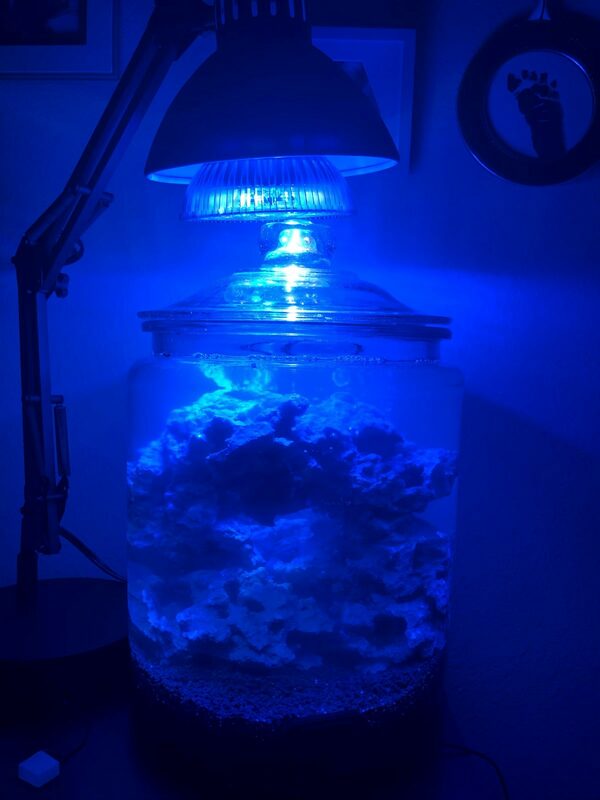 I can't really budget in a small, powerful light like an AI prime or Kessil at the moment, so I opted for an LED blue/white bulb geared for corals. 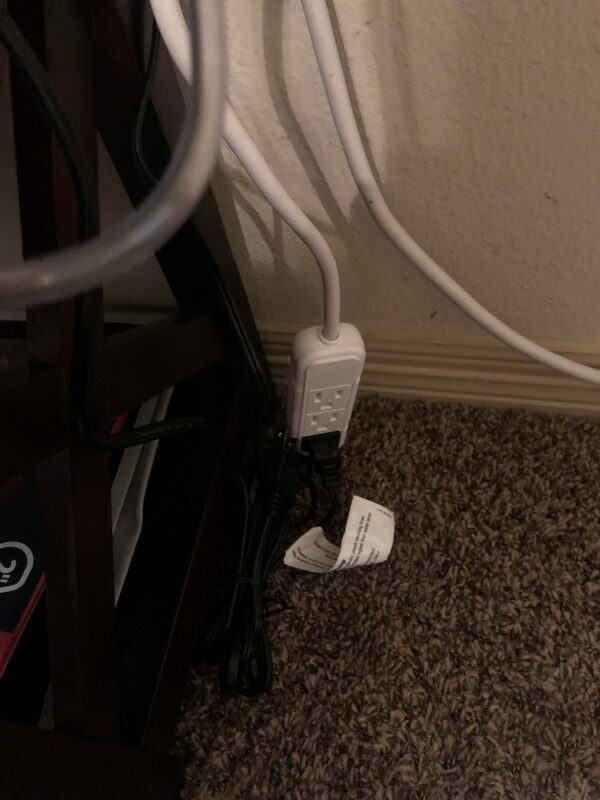 I plan to stick it in a clamp on desk lamp after I get it, and see how that goes. I used a Cobalt Pico 10W heater and a cheapo Amazon bought thermometer to monitor the water temp. The circulation is being run by the Tetra Whisper 10-30gph air pump with an air stone wedged under the central rock column. I love it so far- can't hear it at all, since it's so quiet, and it came with a regulator so I can adjust how hard it's bubbling. After this system takes however long it must to cycle, I hope to introduce some neat neon GSP I saw at the LFS, and some zoas. Nothing really crazy since it's so small. 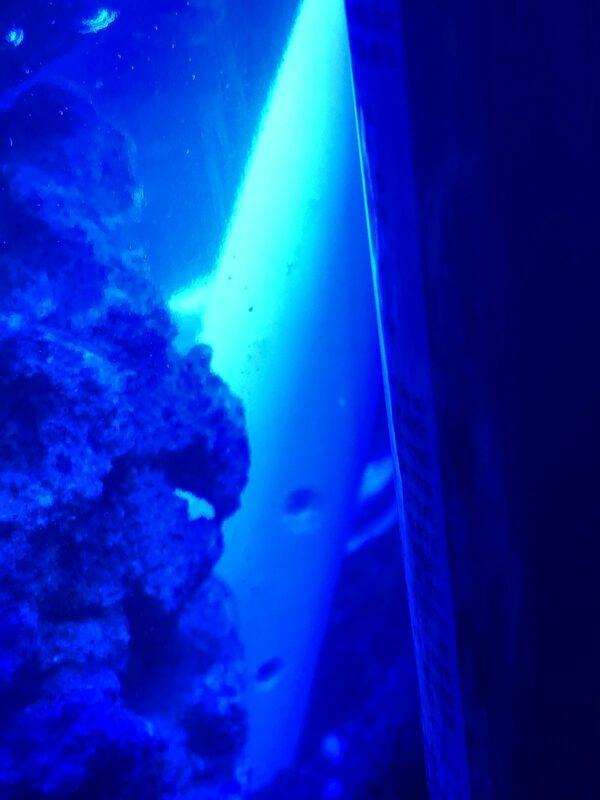 And possibly a fire fish (although the husband didn't like them much, so possibly not), or a goby/shrimp pair. I plan for a couple of bumble bee snails and finding something small to clean the glass as well. A few dwarf blue hermits with maybe something else colorful mixed in. May not be able to get a fish in there in the end, but at least the crabs and snails will be nice to watch. Anyway, tis the start of a new wee adventure! in your bedroom? don't think the air pump and bubble noise will drive you to insanity? No!! You literally cannot hear the little air pump. And really not even the bubbling, since they're comping up from the center. The lid is also on it, to help prevent spatter and evaporations. Trust me--my husband immediately checked it out because can't have anything disrupt his beauty rest! Got the sand in today. It was a 20lb bag, so I can't tell you exactly how much by weight I put in the jar, but it gave me a good, consistent 1-1.5 inch of sand bed. I love the color being black too-goes well with the bookcase it's sitting on. 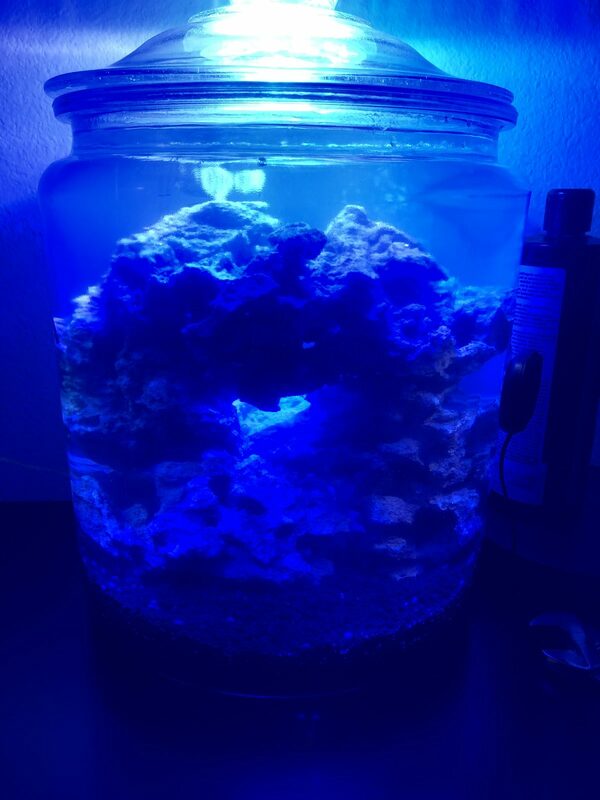 I hope it will bring out the colors of the corals placed in there in the future, and whatever single fish I stick in there. The light bulb arrived as well, and mostly fit into the desk lamp I got. The light seems to be transferring into the jar without too much wasted spill, as far as I can tell. 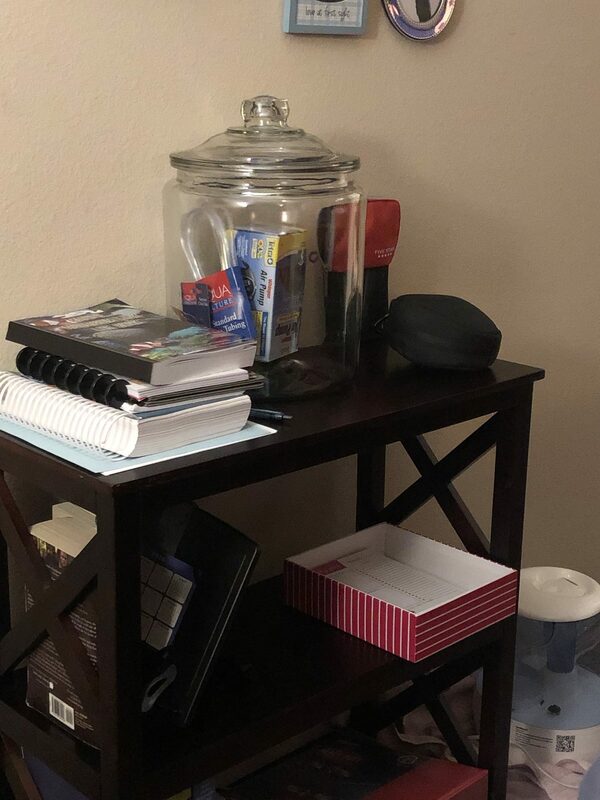 As it's in my bedroom, I will only be giving light to this jar during the day time hours because the hubs isn't going to allow his beauty rest to be disturbed. 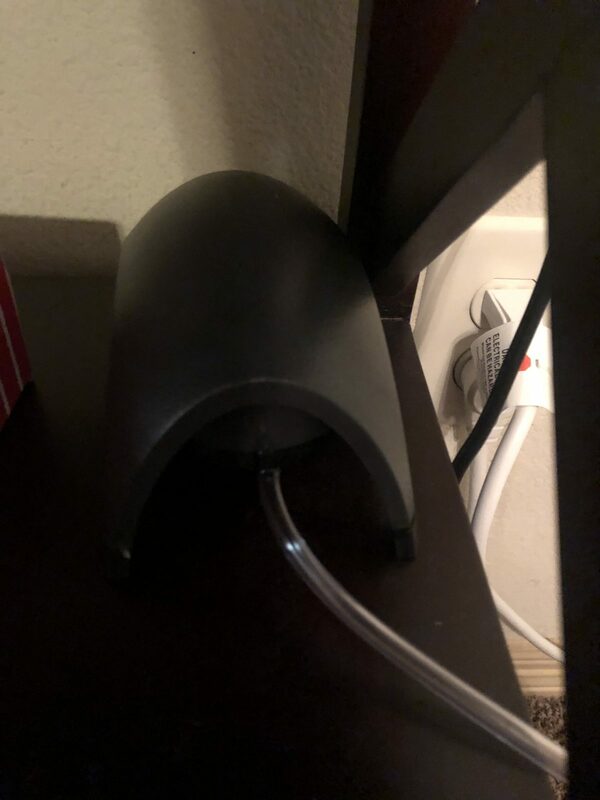 I doubt the brightness of this lamp is going to aid that too much. Anyway, all ready to cycle!! Watching my little heater closely-so far it hasn't gotten the water temp up over 75 degrees so I may have to find a more powerful or least better one. 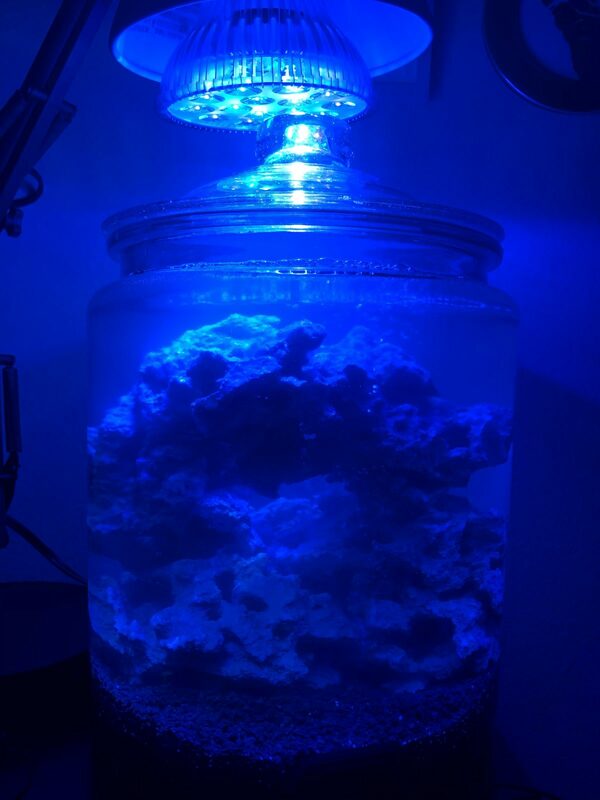 Great to see another pico reef jar coming online! The black reef sand will make for a neat look. There’s quite a bit of rock, I’ll admit. Mostly because they didn’t have small chunks available, and I wanted to make a small arch or hole for the effect. I will-thanks for suggesting it. Never heard about it til now. You should have seen my fingers with all the super glue on them 😢. Thank goodness for fingernail polish remover! 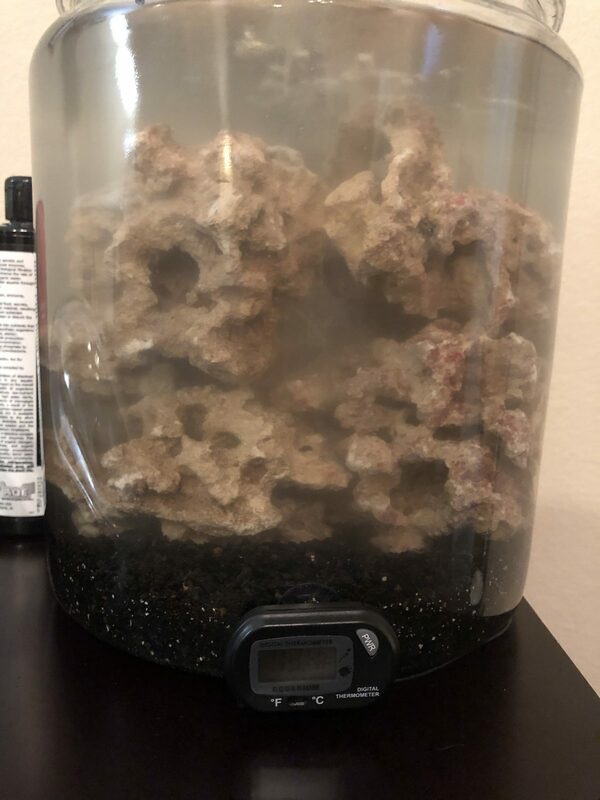 On the advice of a wise person, I added some of the Evo’s tank water to my jar yesterday, and a few fish food pellets per a post I’d seen here on making tanks cycle. Tonight when I tested, I was pleased to note some movement on the ammonia! Im still adding in Microbacter 7 for bacteria population, and the sand was supposed to be live, so I’m pleased to see something starting within only 5 days. 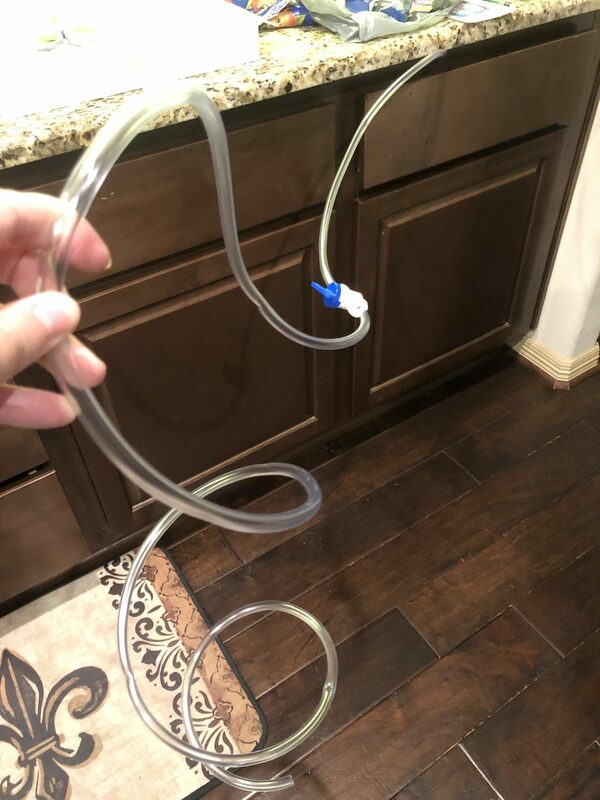 I also finally got around to making a smaller siphoning tube with a ball valve for this jar, since my siphon vacs are way too big. And made a “lift pipe” as seen on GraniteReefer’s little jar. The little cobalt mini thermometer is actually over heating the water a bit, so may have to crack the jar lid open a little more for temp control. Or I may have to find something a little better in the end- it doesn’t keep it warm at night when I cool the house down. I’ve noticed a temp range of 76-83 and change. Anybody know a good mini or Pico heater that can be controlled with an ink bird? Or something like? Otherwise just waiting on a good cycle to pick up steam. Today got even more encouraging test results! Nitrites- 0 but you can see it trying to get some purple, which means it want to creep to a new number. 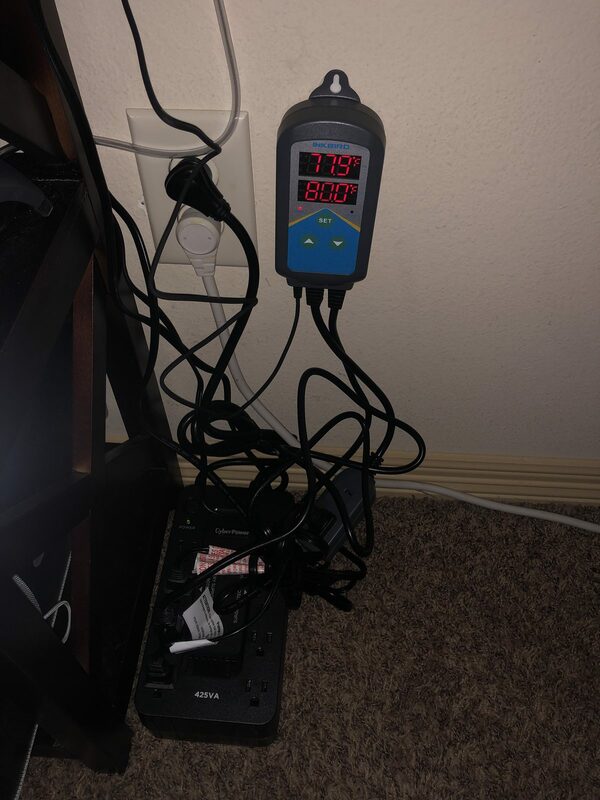 I ordered the jar an ink bird controller because it doesn’t hold its temp at night and often gets too hot during the day. I also ordered a bottle of Dr Tim’s because people keep saying it gets faster, good results. So, moving along! Woohoo!! The Dr Tim's came in today, so I dosed the jar with half of that bottle and stored the rest in the fridge. It was a big bottle, so I figured if I need a second round I'm set. I also went ahead with the Microbacter 7- I hope they don't cancel each other out. Definite uptick in the numbers today after ghost feeding the tank Saturday. The Dr Tim’s is really working! Results yesterday were encouraging, and I’ll retest tonight when I get home from work. Hope this cycling show starts to show some resolution soon- it’s nice to see that my efforts pay off for all the hard work. I also got the ink bird and battery back up in yesterday and got them hooked up for the little jar. I hope the ink bird helps regulate the temp better. So far, the Ink Bird seems to be regulating the little Cobalt mini 10W heater well. Can definitely see the bacterial ick growing in the tank- just wish they'd hurry their microscopic selves up! The nasty water is making my soul bleed a little. Yesterday was a disaster so I was too tired to update this. The heater will have to be upgraded; it doesn't keep up with my air conditioner in the house at night. I'll most likely upgrade to a 25w Neotherm. Just cycling away. I wonder- should I give the jar the rest of the Dr Tim's to help get it to the finish line? Any thoughts on this would be awesome. Ooh good idea, I need to do something like this! 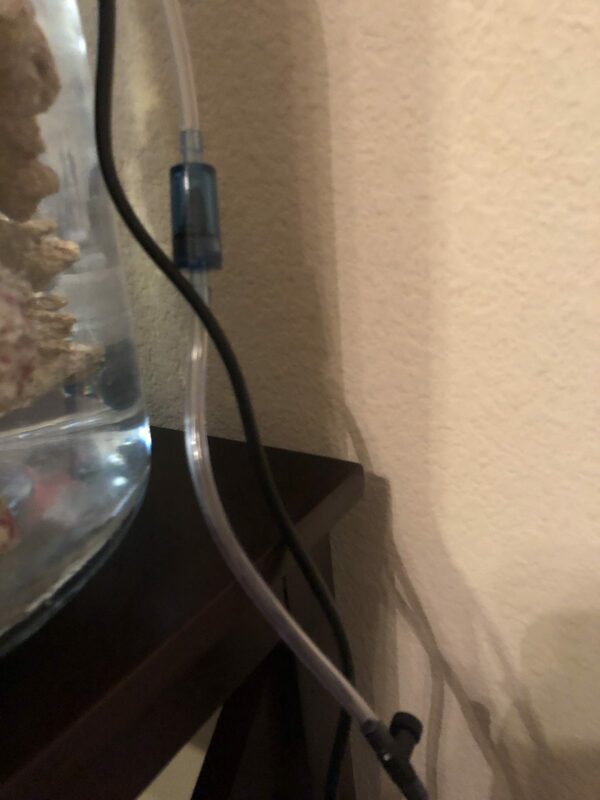 I've been using air line tubing to siphon my jar. You should have enough ammonia in there now to complete the cycle process, I don't think you'll need any more. Save a little ammonia to dose at the very end, to test that the cycle is complete. 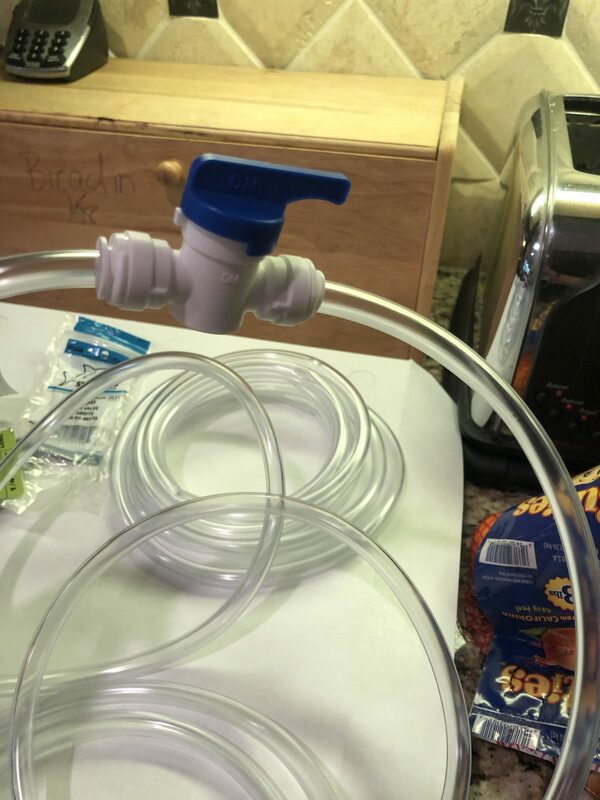 The siphon tube works great but you do have to watch the speed and be quick with using the ball valve to slow it down! Can you explain the ammonia part a little more? I don’t have straight ammonia to dose, just Dr Tim’s one and only- the bacteria. But if I did, how would dosing ammonia at the end work? Seems to be rocking along! !